Wash the flattened rice in water and drain the excess water. Sprinkle ½ cup of water again and cover it with a lid. Allow it to soften for 15 minutes. Place a thick bottomed pan on stove and pour oil into it. Add cumin seeds and mustard seeds. When they splutter add sliced potatoes and turn them well till they become soft. Add chopped onion, chillies, curry leaves, asafetida, and turmeric. Stir fry everything till onions lose their raw odor. Now simmer the flame and add soaked flattened rice, salt, sugar and mix everything well. Cover a lid and turn off stove after 3 minutes. Squeeze lemon, and turn it well. Serve it after garnishing with grated coconut and coriander leaves. Roasted ground nuts can be added for a variation. Flattened rice is dehusked rice which is beaten and dried into thin flakes. It is a good energizer and is free of fat. Flattened rice is easily digested and helps in problems like indigestion, constipation and cough. Fat, sodium and cholesterol is almost nil in this rice variety. Hence it is very helpful for persons who are on weight loss program. It can be used by persons who suffer from hypertension, elevated blood cholesterol and obesity. 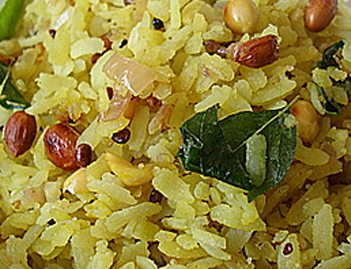 Soaked flattened rice can be eaten with milk, curd and sugar.